From Fes, we managed to hop on board a direct train to Casablanca. The train takes roughly four hours and was much posher than any of our trains at home. I’m not sure how much Miles and I appreciated it however – we slept almost the entire way! Casablanca was maybe our least favourite stop on our trip – even though it’s the largest city in Morocco we didn’t necessarily think there was that much to do. Part of this is down to the fact that we were travelling through the country during Ramadan which meant that many places closed down during the day. We didn’t notice this as much anywhere else we visited. It seemed particularly difficult here – we found it hard even to pick up a quick lunch. 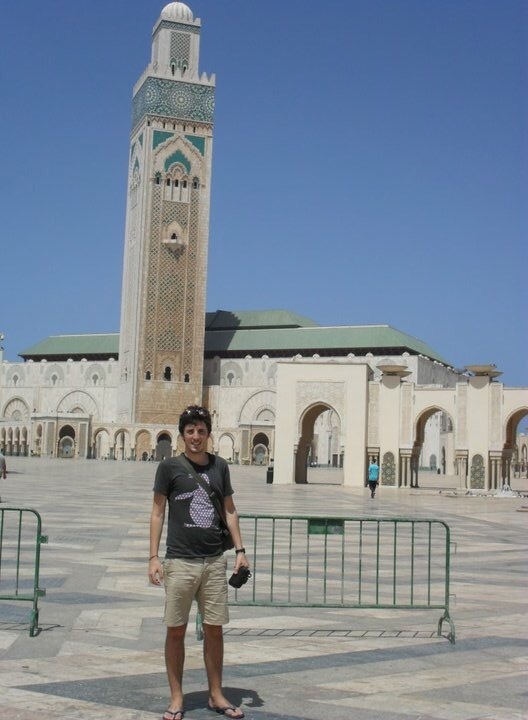 We did spend a bit of time on the beach and visit Hassan II Mosque (the largest mosque in Africa and the third largest in the world) but after one day/night in the city we decided to hit the road again. Having left Casablanca we traveled back down to Marrakech where we enjoyed an evening of mint tea, snails and an evening out on the square. We ate again at Djeema al Fna before heading back to the same hotel – hotel Essaouria. This time we opted against booking a private room and instead paid for a mat and slept up on the roof under the stars with travellers cosied up either side of us. It was definitely an experience, but so worth it for the saving in accommodation costs, even if you are woken up at 5am by the call to prayer! The next morning, at around about 7am we headed to the square where we were picked up by a minibus and set off to commence our three day trek to the Sahara! Great Post, nice pics. poor snails.